"නටරාජ්" මෙතැනට යළියොමුවෙයි. වෙනත් භාවිතා සඳහා, නටරාජ් (වක්‍රෝක්තිහරණය) බලන්න. නටරාජ (සංස්කෘත: नटराज, "නර්තනයට අධිපති") යනු හින්දු දෙවි ශිව විශ්වීය නර්තන ශිල්පියා ලෙස නිරූපණය කිරීමයි. ඔහුගේ නර්තනය සංදර්භය මත පදනම්ව තාණ්ඩවම් හෝ නඩාන්ත ලෙස හැඳින්වේ. මෙම ඉරියව්ව සහ කලාකෘති පිළිබඳ අංශුමාද්භේද ආගම සහ උත්තරකාමික ආගම වැනි බොහෝ හින්දු ග්‍රන්ථවල සඳහන් වන අතර, මෙම නර්තන කැටයම් හෝ ප්‍රතිමා සියලු ප්‍රධාන ශෛවාගමික හින්දු දේවාලවල දක්නට ලැබේ. මෙහි සම්භාව්‍ය නිරූපණය 6වන සියවස අවට එල්ලෝරා ලෙන් සහ බදාමි ලෙන් කැටයම්වල දක්නට ලැබේ. 10වන සියවස අවට, තමිල් නාඩුව තුළ එහි වඩාත් පරිණතම සහ ප්‍රකටම නිදසුන් චෝළ ලෝකඩ ප්‍රතිමාවලින් දැකගත හැක. විවිධ උසින් යුත් මෙම ප්‍රතිමා සාමාන්‍යයෙන් අඩි හතරට වඩා උසින් අඩු අතර වැඩි අවස්ථා ද හමුවේ. ඓතිහාසික කලා නිර්මාණ අතර නටරාජා කැටම් දකුණු ඉන්දියාවේ බොහෝ ප්‍රදේශ, අග්නිදිග ආසියාවේ බාලි හා කාම්බෝජය වැනි ප්‍රදේශවලින් සහ මධ්‍ය ආසියාවෙන් හමුවේ. නර්තන සහ නාට්‍යමය කලාවන්ට අධිපති ලෙස ශිව දෙවියන් නිරූපණය කළ මෙම ප්‍රතිමා කලාව පිළිබඳ හින්දු ග්‍රන්ථවල සඳහන් ශෛලීන් සහ මිනුම් උපයෝගී කොටගෙන නිර්මාණය කරන ලදී. එමගින් දර්ශීයව ශිව එක් නාට්‍ය ශාස්ත්‍ර ඉරියව්වකින් යුතුව, සිය පසුපස වම් හස්තයේ අග්නිය දරාසිටින අතර, එහි ඉදිරි හස්තයෙන් ගජහස්ත හෙවත් දණ්ඩහස්ත මුද්‍රාවත්, නාගයකු එතී සිටින ඉදිරිපස දකුණු හස්තයේ අභය (බිය නොවීම) මුද්‍රාවත් නිරූපණය වේ. එය සූත්‍ර පාඨයක් කෙරෙහි යොමු කොට ඇත. පසුපස දකුණු හස්තයෙහි බොහෝවිට දමරු නම් උඩැක්කියක් වැනි සංගීත භාණ්ඩයක් දරාසිටිනු නිරූපිත ය. ඔහුගේ සිරුර, ඇඟිලි, වළලුකර, ගෙල, මුහුණ, හිස, කන් පෙති සහ වස්ත්‍රය විවිධ මෝස්තරවලින් අලංකාර කොට ඇති අතර, ඒවා ඓතිහාසික යුගය සහ ප්‍රදේශය අනුව වෙනස් විය හැක. ඔහු වටා ගිනි සිළු වළල්ලක් ඇති අතර, පද්ම පීඨයක් මත සිය වම් පාදය ඔසවාගෙන (කලාතුරකින් දකුණු පාදය ඔසවා සිටින අවස්ථා ද හමුවේ) සිටියි. සිය දකුණු පාදයෙන් වාමනයකු පාගාගෙන සමබරව සිටියි. මෙම වාමන රුව (අපස්මාර හෝ මූයලක) මගින් අවිද්‍යාව සංකේතවත් කෙරේ. මෙම උද්වේගී නර්තනයේ ඇති ගතික ස්වභාවය කැරකැවී ගිය කේශ කලාපයෙන් පෙනී යන අතර, එහි සිහින් කෙස් වැටි හිසට පිටුපසින් විජිනියක් මෙන් සැකසී ඇත. 12වන සියවසේ සිටම ඉන්දියානු විද්වතුන් විසින් නටරාජ රුවේ ලක්ෂණ විවිධ අයුරින් අර්ථ දක්වා ඇති අතර, එහි සංකේතාත්මක සහ දාර්ශනික අර්ථය එහි දී ඉදිරිපත් කොට ඇත. ඉන්දියාවේ වඩාත් ප්‍රචලිත ප්‍රතිමා සංකේතයක් වන නටරාජ රුව ඇතැම් අවස්ථාවල දී ඉන්දීය සංස්කෘතියේ සංකේතයක් ලෙස ද භාවිතා වේ. එපමණක් නොව එය හින්දු කලාවේ අග්‍රගන්‍ය නිර්මාණයක් ලෙස ද සැලකේ. මේලකාදම්බූර්හි ශිව දේවාලයෙහි අත් දහයක් සහිතව නටරාජා සිය ගවයා මත නැගී සිටිනු නිරූපිත විරළ ගණයේ පාල ප්‍රතිමාවක් ඇත. ↑ 4.0 4.1 James C. Harle (1994). The Art and Architecture of the Indian Subcontinent. Yale University Press. පි. 126. ISBN 978-0-300-06217-5. https://books.google.com/books?id=LwcBVvdqyBkC. ↑ Archana Verma (2012). Temple Imagery from Early Mediaeval Peninsular India. Ashgate Publishing. පිටු 150–151. ISBN 978-1-4094-3029-2. https://books.google.com/books?id=HOc9RG6MSzgC. ↑ 6.0 6.1 6.2 6.3 T. A. Gopinatha Rao (1997). Elements of Hindu Iconography. Motilal Banarsidass. පිටු 223–229, 237. ISBN 978-81-208-0877-5. https://books.google.com/books?id=e7mP3kDzGuoC. ↑ 8.0 8.1 Saroj Panthey (1987). Iconography of Śiva in Pahāṛī Paintings. Mittal Publications. පිටු 59–60, 88. ISBN 978-81-7099-016-1. https://books.google.com/books?id=GUBXNueBQo0C. ↑ Mahadev Chakravarti (1986). The Concept of Rudra-Śiva Through the Ages. Motilal Banarsidass. පි. 178 with footnotes. ISBN 978-81-208-0053-3. https://books.google.com/books?id=yMFwMHH4HzMC. ↑ T. A. Gopinatha Rao (1997). Elements of Hindu Iconography. Motilal Banarsidass. පිටු 236–238, 247–258. ISBN 978-81-208-0877-5. https://books.google.com/books?id=e7mP3kDzGuoC. ↑ Anna Libera Dallapiccola (2007). Indian Art in Detail. Harvard University Press. පි. 28. ISBN 978-0-674-02691-9. https://books.google.com/books?id=JR1rj6wxlo8C. ↑ David Smith (2003). The Dance of Siva: Religion, Art and Poetry in South India. Cambridge University Press. පිටු 1–2. ISBN 978-0-521-52865-8. https://books.google.com/books?id=fTLlcGlkdjkC&pg=PA1. ↑ Frank Burch Brown (2014). The Oxford Handbook of Religion and the Arts. Oxford University Press. පිටු 489–490. ISBN 978-0-19-517667-4. https://books.google.com/books?id=GkvSAQAAQBAJ&pg=PA489. ↑ James C. Harle (1994). The Art and Architecture of the Indian Subcontinent. Yale University Press. පි. 123. ISBN 978-0-300-06217-5. https://books.google.com/books?id=LwcBVvdqyBkC. Ananda Coomaraswamy (1957). The Dance of Śiva: Fourteen Indian Essays. OCLC 2155403. https://books.google.com/books?id=dC9KAcy8QNsC. Jansen, Eva Rudy (1993). The Book of Hindu Imagery. Havelte, Holland: Binkey Kok Publications BV. ISBN 90-74597-07-6. https://books.google.com/books?id=1iASyoae8cMC. Vivek Nanda; George Michell (2004). Chidambaram: Home of Nataraja. Marg Publications. ISBN 978-81-85026-64-0. OCLC 56598256. https://books.google.com/books?id=jurVAAAAMAAJ. C Sivaramamurti (1974). 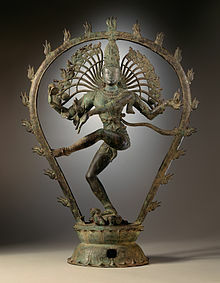 Nataraja in Art, Thought, and Literature. National Museum. ISBN 978-81-230-0092-3. OCLC 1501803. https://books.google.com/books?id=4qDzAAAACAAJ. David Smith (2003). The Dance of Siva: Religion, Art and Poetry in South India. Cambridge University Press. ISBN 978-0-521-52865-8. https://books.google.com/books?id=fTLlcGlkdjkC&pg=PA2. මේ පිටුව අන්තිමට සැකසුවේ 4 ඔක්තෝබර් 2017 දින දී, 04:25 වේලාවෙහිදීය.